During its impressive 25 years the Hubble Space Telescope has captured numerous remarkable views of the universe, providing astronomers with a wealth of data for making astounding discoveries. 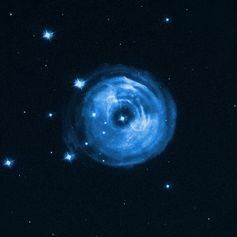 Of all the beautiful astronomical objects observed by Hubble one of the most awe-inspiring is the massive, dying star V838 Moncerotis. 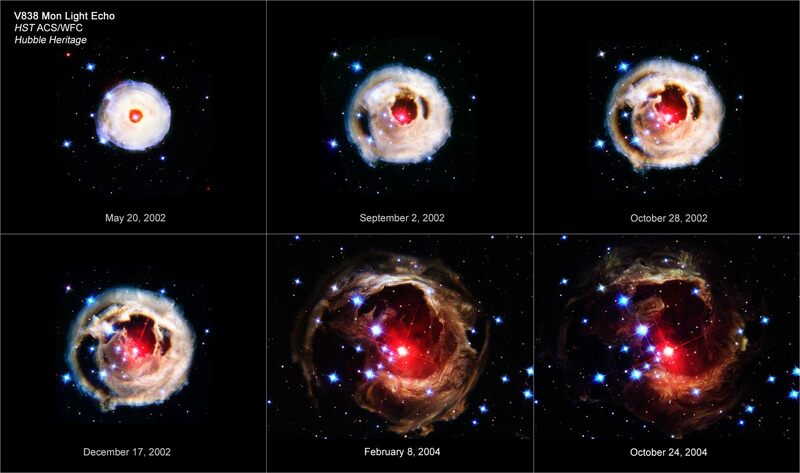 Hubble’s longevity has provided astronomers with a series of detailed images of V838 Mon captured between May 2002 and September 2006: the result is a fascinating “time-lapse” that uniquely illuminates the evolution of this massive, super-giant star. Hubble’s exceptionally sharp focus of V838 Mon offered a ring-side seat at the slow death of the star and excited astrophysicists with the chance to study the physics of the light, matter and microscopic dust of the interstellar medium. V838 Monocerotis in April 2002, as the first flash of bright blue light emanates from the star. V838 Mon is about 20,000 light-years away from Earth, in the direction of the constellation of Monoceros (the unicorn). This enormous distance places the star at the outskirts of our galaxy, the Milky Way. In 2002 the star underwent an enigmatic and spectacular brightening, briefly becoming one of the most luminous stars in the Galaxy. This stellar flash blasted out radiation at a rate 600,000 times the output of our sun. 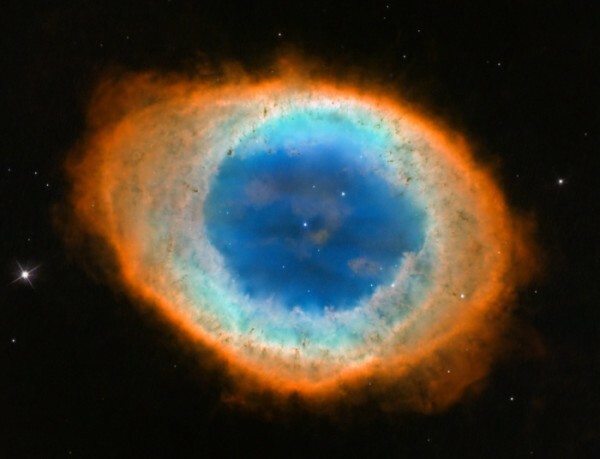 The astounding Hubble images taken over the following years reveal the flash of light illuminating the shells of dust and gas that surround the star. At first glace, the ring of colour suggests we are witnessing the gradual expansion of the ejected shell of the exploding star. But in fact what are seeing is an extraordinary “light echo”. As light from the powerful flash propagates outward at 300,000km per second, it travels through successive rings of dust that surround the star. Some light is scattered by micron-sized dust particles in the dust clouds, reflected back towards the telescope and Earth. The scattered light has travelled a greater distance than the light that arrived directly from the original flash, and so arrives later. This light echo is the optical analogue of the more familiar sound echo, generated when for example thunder bounces of surrounding mountain-sides. 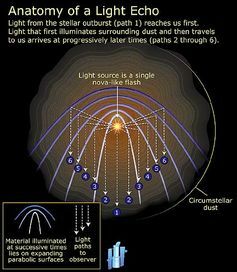 The route the ‘light echo’ took, from star to telescope. The light echo discovered by Hubble reveals successive layers of matter and dust, spanning light-years across. The images betray earlier phases in the life of a now ageing, red super-giant star. The latest images in this time-lapse from 2005 and 2006 show an object around about six light-years in diameter, and reveal the turbulent and intricate structure of the interstellar medium, a region where it seems magnetic fields thread the space between stars. All of these sharp images were taken using the Advanced Camera for Surveys (ACS), which had only just been installed on Hubble during a service mission in March 2002. The images approach true colours by combining data filtered to isolate blue, green and infrared light. After the initial flash, the light reflected from successively more distant dust clouds reaches Earth. The cause of the powerful light flash remains mysterious and debated. One suggestion is that as V838 Mon evolves, its outer layers expand to engulf one or more unseen gas giant planets (or “hot Jupiters”) that may have orbited the star. The subsequent release of the planets’ gravitational energy could result in a brightening of the star, though it’s not certain whether this would be sufficient to explain the magnitude of the light flash. Another scenario is that it may have been the result on an unusual nova-like eruption, where matter from a companion star is pulled by gravity onto the surface of a collapsed white dwarf star, triggering a thermonuclear explosion. The current leading theory is that a low-mass star, perhaps one-third of the mass of the sun, collided and merged with V838 Mon. The space between stars in enormous compared to the diameter of any star, and therefore stellar collisions are very rare. However, if a pair of stars is born together they will orbit each other, and with loss of orbital energy the low-mass companion may eventually be drawn into the more massive star. The result would be a huge blast of energy. Transforming from an unremarkable speck in the sky to one of the most extraordinary and beautiful objects, the echoes of V838 Mon will be monitored by astronomers from space telescopes and those on the ground. V838 Mon continues to reveal more to us about the structure of stars, the nature of dust shells spreading into the interstellar medium, and the life – and death – of the most massive stars.